The first Friday in October marks “World Smile Day,” an international day of observance started by artist Harvey Ball, who was best known for inventing the classic yellow ‘smiley face.’ World Smile Day was first held in 1999, and after Ball’s death in 2001, the Harvey Ball World Smile Foundation was created to keep World Smile Day going strong. The goal of the day is to make as many people throughout the world smile through acts of kindness. As dentists, we know not everyone is comfortable flashing a smile. Whether a person is unhappy with crooked or chipped teeth, stained teeth, or perhaps no teeth at all, our cosmetic dentists are here to help. Keep reading to learn about how our local dentists can repair and restore teeth. Professional Teeth Whitening: Sometimes all a dull smile needs is a professional teeth whitening session. Our in-office Boost Whitening System offers the strongest teeth whitening power on the market! Porcelain Crowns: If you’re tempted to not show your teeth because of noticeable metal crowns, our dentists offer tooth-colored crowns made of porcelain. These crowns are incredibly durable and the perfect option for replacing metallic crowns. Porcelain Veneers: Veneers act like a shell that adheres to the front of your teeth. Each set of veneers is designed individually to create a perfect smile that mimics your true smile. Dental Bonding: Bonding is an alternative to veneers and helps to restore chipped, cracked, misaligned, or severely stained teeth, allowing you to smile with confidence. Invisalign®: Many adults find themselves wishing for straighter teeth, but they don’t want to wear metal braces for months. Invisible aligners are the perfect option. These removable trays are worn for most of the day but can be taken out for eating and special occasions. So if crooked teeth are keeping you from smiling, ask our dentists about Invisalign® at your next visit! If your smile needs more than cosmetic dentistry, we offer dental services to repair and replace damaged, infected, or missing teeth. We have several options to replace missing teeth. Your dentist will discuss all of the options with you to determine which is best. These include fixed dental bridges, partial dentures, and dental implants, all of which can give you realistic-looking false teeth. Schedule An Appointment To Improve Your Smile Today! We hope you will find many reasons to smile today! 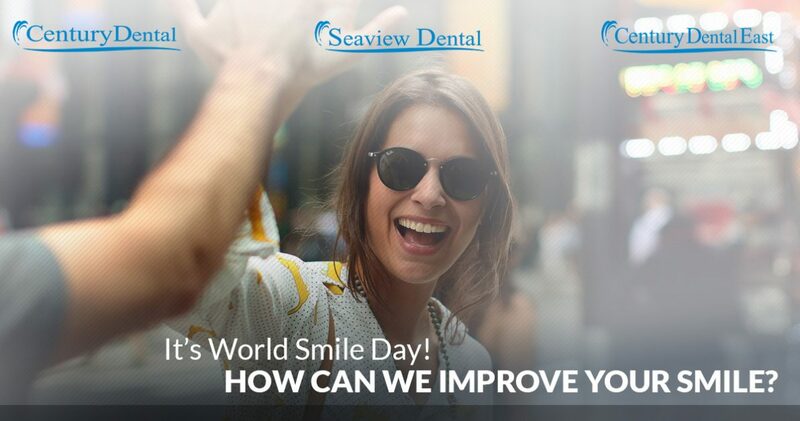 At our dental practices, we’ll spend World Smile Day like we spend every day: helping our patients get the smiles they have always wanted. To keep your smile healthy, it is important to visit your dentist every six months for an examination and cleaning. With three dental offices to choose from — in Eatontown, Jackson, and Pine Beach — our New Jersey dentists are never far away! Get in touch today to schedule an examination and speak with a dentist about cosmetic or restorative dental procedures that can benefit you!